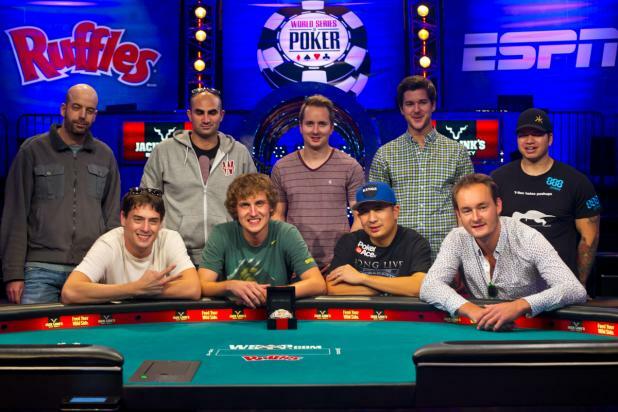 WSOP Main Event fever is almost upon us once more, with just three weeks to go for the November Nine to reappear in all their gambling glory. With that in mind, online casino site Bovada has released its betting odds for the World Series of Poker Main Event final table, installing chip leader Jorryt van HoofÂ as the odds-on favorite. The posted odds generally reflect the starting chip positions of each player, with seemingly few adjustments made for the perceived skill levels. That means that van Hoof and his 38,375,000 chips are a favorite, but not an overwhelming one. Bovada has the Dutch poker pro listed at 57/20, or a little less than 3/1 to win the tournament. No matter where van Hoof finishes at the final table, this will mark his biggest career win, as he has less than $500,000 in career earnings outside of this year’s Main Event. The second choice in betting, and also second in chips with just under 32.8 million, is Felix Stephensen. Bovada has Stephensen, a Norwegian poker player with little other major event experience, at 4/1. Perhaps the most interesting story of this year’s final table is that of Mark Newhouse, who is making his second consecutive final table appearance. He comes into the November Nine with 26 million in chips, and is listed at 5/1 in the Bovada sports book. Newhouse is the first player since Dan Harrington in 2003-2004 to make back-to-back Main Event final tables, and has won over $2.7 million in his tournament career. One player who does appear to be getting some credit beyond his chip stack is Martin Jacobson. The Swedish poker pro has over $5.5 million in career tournament earnings (including the prize money he has already received for making the WSOP final table), and is being given 8/1 odds of winning the Main Event, despite the fact that he comes in eighth in chips at 14.9 million. Another popular figure at the final table is sure to be that of Billy Pappaconstantinou, the champion foosball player who is now looking to score a poker championship as well. While he doesn’t have the pedigree of some of his competitors, and his 17.5 million in chips ranks only sixth at the table, he’ll likely be a popular bet at 10/1. Andoni Larrabe is the youngest player remaining in contention, but the 22-year-old Spaniard is sure to get some support from fans and bettors alike. He comes in with a very healthy 22.5 million in chips, and Bovada has him listed with 7/1 odds to ultimately win the tournament. Other players at the final table include Dan Sindelar (15/2), William Tonking (12/1), and short stack Bruno Politano (16/1), who comes in with just over 12 million in chips. Bovada is also offering a bet on the nationality of the eventual winner. Four of the players at the final table (Pappaconstantinou, Newhouse, Tonkin and Sindelar) are American, and bettors can get 3/2 odds on one of them walking away with the title. If you prefer the chances of the international players, Bovada is also offering 1/2 odds on any other player securing the top prize. The 2014 WSOP Main Event began with 6,683 players, but is now down to just nine competitors still vying for a top prize of $10 million. Play will resume on November 10, with a winner ultimately being determined the next day. Each player has already received the ninth-place prize of $730,725.